$1.18 for I Can't Believe It's Not Butter! 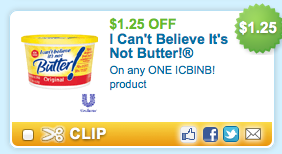 Head over to Coupons.com and print out this high value $1.25/1 any I Can't Believe It's Not Butter product coupon. Hold onto it for a sale...these frequently go on sale for around $2, making it only $0.75 after coupon!